This is exciting news for anyone who loves the concept of food halls and open markets. Atlanta has found popular success with similar endeavors such as Krog Street Market and Ponce City Market. Kennesaw has a similar development, dubbed Kennesaw Marketplace, slated to open in phases this year. 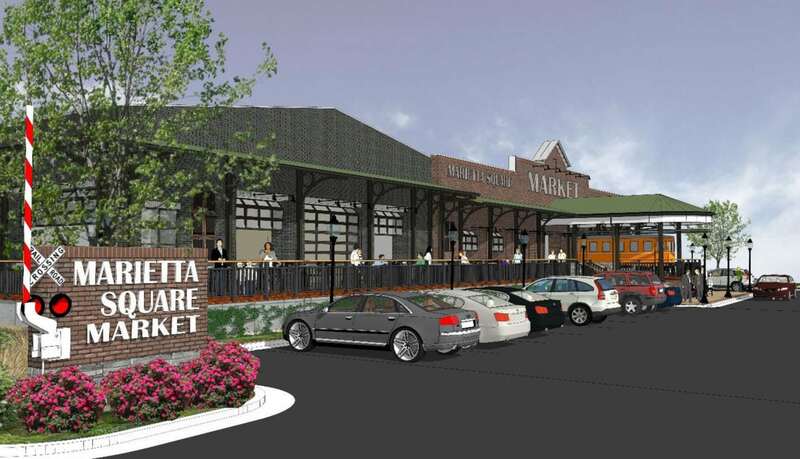 But, the Marietta Market will fill a geographical need for foodies who don’t want to venture across town to find plentiful options in a single spot. The project will convert an empty 18,000 square foot warehouse located just off the square into multiple restaurants and storefronts. Current plans detail 3 larger restaurants and 8 smaller kiosks, between 400 and 800 square feet each, with a central bar serving craft drinks. One of the kiosks will be a fully restored 1922 streetcar similar to the kind that once transported passengers between Marietta and Atlanta. The streetcar will lend to the appearance of the turn-of-the-century train depot theme. Glass garage doors will open to a patio in good weather to provide open atmosphere dining. The Marietta Square Market is set to open in the Summer of 2018.